FNx01Excerpted from Willus, F.A., & Keyes, T.E., 1941. CARDIAC CLASSICS: A Collection of Classic Works on the Heart and Circulation with Comprehensive Biographic Accounts of the Authors. St. Louis, Mo; C.V. Mosby Company. Four years before Laennec happened upon the discovery of mediate auscultation, Austin Flint was born on October 20 at Petersham in Massachusetts. He was the son of Dr. Joseph Henshaw Flint, a well-known physician and surgeon of Northampton, Massachusetts. His grandfather, Dr. Austin Flint of Leicester, served as a surgeon in the war of the American Revolution; and his great-grandfather, Dr. Edward Flint, was a noted practitioner from Shrewsbury, Massachusetts. Reared in such an impressive professional tradition, it was not surprising that young Austin Flint should join the ranks of American physicians. Nor did this line of physicians halt with the subject of our memoir, for his son, Austin, Junior, was a physician. So also was Austin Junior's son, who at this writing is professor emeritus of obstetrics in the New York University College of Medicine. Those who are proud of the achievements of American medicine feel a real debt of gratitude to the Flints, who have greatly enriched American medicine, and especially to Austin Flint, Senior, one of the most important American pioneers, whose achievements have been linked with those of Skoda, Stokes, and Walshe. Austin Flint, Senior, was a student at Amherst and Harvard Colleges. He studied medicine at the Harvard Medical School and graduated from that institution in 1833. Flint was fortunate in having among his teachers Jacob Bigelow (1787-1879) and James Jackson (1777-1868). Bigelow was professor of Materia Medica at Harvard, author of the three-volume "American Medical Botany" (1818-1820), and one of the greatest of American botanists. Jackson had studied medicine in St. Thomas' Hospital (London) where he had been a student of Astley Cooper. He became professor of medicine at Harvard, and during Flint's student days, was much interested in the subject of physical exploration. Flint said of him: "He never failed to carry the stethoscope during his hospital visits, and the signs of cardiac and pulmonary disease entered largely into his clinical instructions." Oliver Wendell Holmes said Jackson was: "thoughtful in youth, but not austere in age; calm but not cold, and cheerful though a sage." For the first 3 years after his graduation, Flint practiced medicine at both Northampton and Boston, Massachusetts. He then moved to Buffalo, New York. In 1844, he accepted the professorship of the theory and practice of medicine at Kush Medical College, Chicago, retaining his residence in Buffalo. He held his post at Bush for a year, at the end of which he resigned to establish the Buffalo Medical and Surgical Journal. He was the editor of this publication for 10 years. In 1847, Flint, with Dr. James P. White and Dr. Frank H. Hamilton, founded the Buffalo Medical College, which is now the School of Medicine of the University of Buffalo. At Buffalo Medical College, Flint taught the theory and practice of Medicine, as well as clinical medicine, until 1852, when he resigned to become professor of the theory and practice of medicine at the University of Louisville. Flint was a member of many medical and scientific societies in America and Europe. 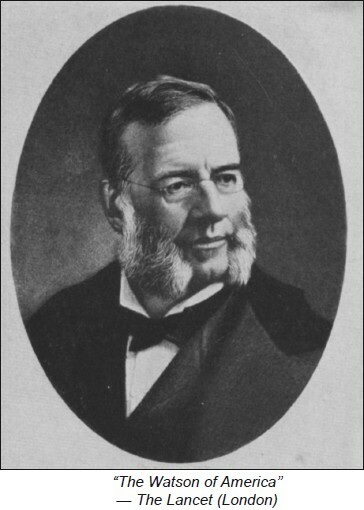 He was elected to the presidency of the New York Academy of Medicine for the term 1873-1874. In 1883, he was elected president of the American Medical Association, an office which he had not sought and which he did not desire. He had been made chairman of the Section on Practical Medicine in 1850, and in fact had helped found the Association in 1848. Austin Flint was a prolific writer on all phases of medicine. It is outside the scope of this brief sketch to list all his contributions to the literature, but mention may be made of his outstanding contributions to physical diagnosis and to his original observations on diseases of the heart and lungs. Flint's name is most frequently thought of in its association with the presystolic murmur which sometimes accompanies aortic regurgitation. He was the first to describe this. Flint heartily disapproved of associating any physical sign with the name of the original describer. He wrote  : "So long as signs are determined from fancied analogies, and named from these or after the person who describes them, there cannot but be obscurity and confusion." The first time he observed the so-called Flint murmur was in 1859, while examining a patient in Charity Hospital in New Orleans who had well-marked signs of aortic insufficiency and stenosis and in whom a presystolic murmur was audible at the apex. At necropsy, however, the mitral valves were found to be normal. This classic description was published in 1862 in the American Journal of Medical Sciences and it is our privilege to reprint it here. Flint was by no means a specialist. His contributions to the study of tuberculosis are among the best in American medical literature. One of the distinguishing features of Austin Flint was the receptiveness of his mind to new ideas. Shortly after Koch tuberculosis in 1882, Flint began having the sputum of patients at Bellevue Hospital examined. From his study of these patients, he immediately saw the enormous importance of Koch's discovery. Flint's last article, which was published posthumously, was "Medicine of the Future." Therein he foresaw that physiologic and pathologic chemistry must be investigated to explain many of the phenomena of health and disease. He foretold great progress in the understanding of this branch of medical science. Austin Flint's death was sudden and unexpected. He had attended a meeting of the faculty of the Bellevue Hospital Medical College on Friday evening of March 12, 1886. On returning home, he proceeded to retire and without any warning a cerebral hemorrhage occurred. This was followed by unconsciousness, resulting in Flint's death 14 hours later, on Saturday, March 13, 1886. 1. Austin F. A Practical Treatise on the Diagnosis, Pathology, and Treatment of Diseases of the Heart. Blanchard and Lea: Philadelphia; 1859. p. 473. 2. Landid HR, Austin F. His Contributions to the Art of Physical Diagnosis and the Study of Tuberculosus. Bull Johns Hopkins Hosp 1912:23;182-6. 3. Austin F. Medicine of the Future. An address prepared for the annual meeting of the British Medical Association. D. Appleton and Co: London;1886. p. 37.